Comment: Mice (presumably) are in walls of 2 of six condo units. Also in attic of one of those two units. No evidence of mice droppings in living areas. Mice making "gnawing" noises, especially in early morning hours. Problem has been intermittent for a few months, increasing in frequency lately. Comment: Bees living in holes around windows and slider. Unable tp utilize deck comfortably in summer. Starting to emerge now. Comment: My home is currently being rented and the family living there is experiencing issues with mice in the basement. The husband is using the basement space as his office and has been having problems with mice trying to share his area. There appears to be entry spots on the left side of the house (as you are facing the front) The basement has a cement floor and cinder block walls. The ceiling is not finished. Please advise if you can assist with a solution. Thanks. Comment: I would like to get an estimate for bed bugs in bedroom in an apartment. Bethel Pest Control Services are rated 4.69 out of 5 based on 1,210 reviews of 14 pros. 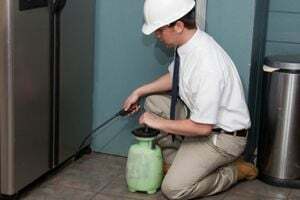 Not Looking for Pest Control Contractors in Bethel, CT?